It is important to keep your dog’s teeth clean. 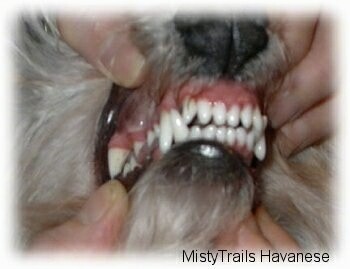 Ideally you need to brush them every day, or every other day. Feeding a food meant to clean teeth is also beneficial. 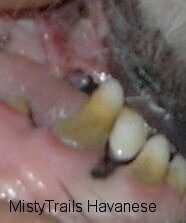 Medi-Cal makes an oral care food, and so does Nutro-Dental care. 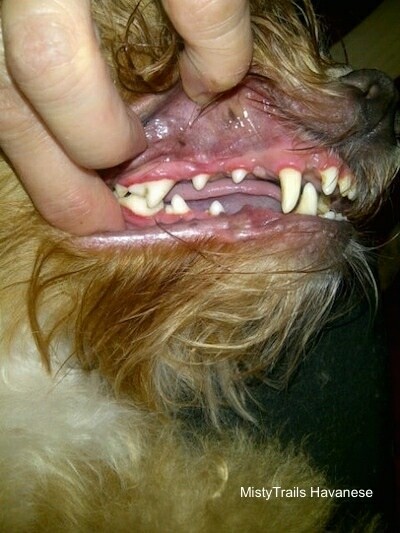 The food is made in a large chunk that does not crumble when the dog eats it, so his teeth have to go in and out, in and out, of the hard piece of food. 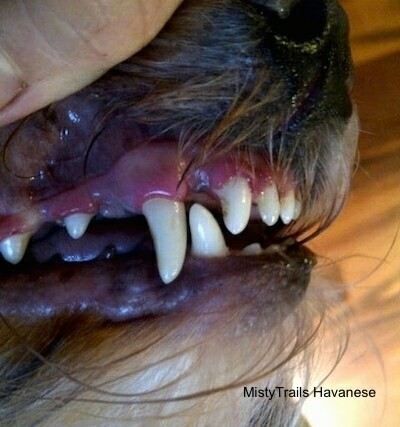 If you notice a lot of tartar on your dog’s teeth then you should make an appointment with your vet for cleaning and scaling. Pictured here is a large piece of scale (tartar). 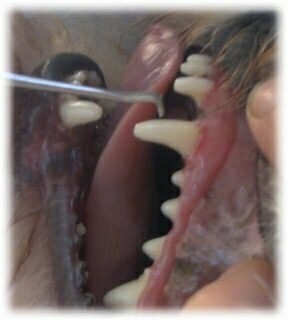 When dogs have this buildup it needs to be taken off of the tooth. It usually comes off easily. 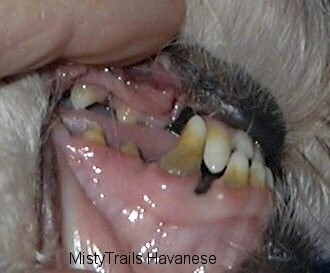 Most dogs that do not get their teeth cleaned regularly need to be put under anesthesia while getting their teeth scaled. It is nice to do this routinely so they can be done while awake without panic. 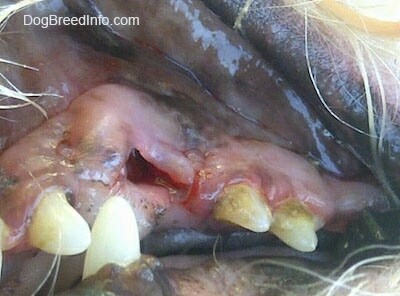 This dog had an abscess. 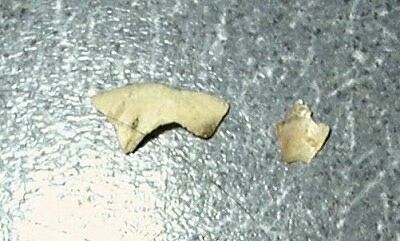 There was puss oozing from the tooth and it needed to be pulled. 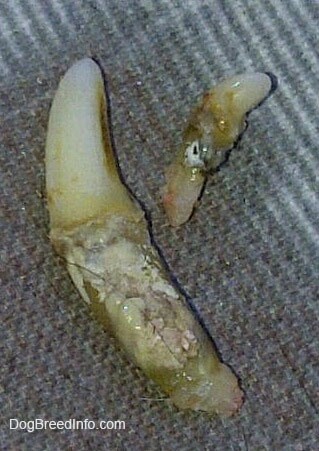 This image shows the hole in the gum after the tooth was taken out. 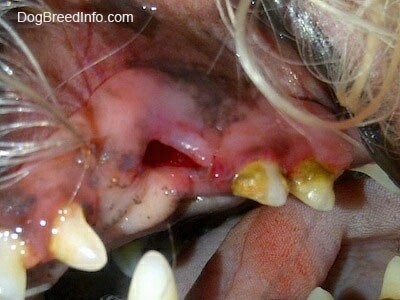 This image shows the hole in the gum after an abscess tooth was taken out. 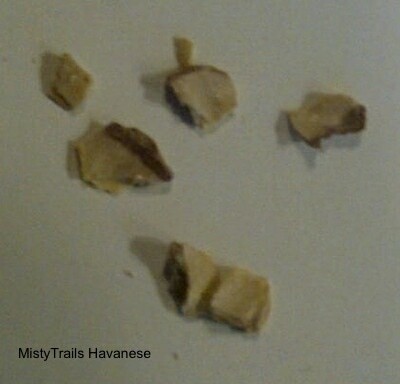 Shown here are two teeth that were pulled from a dog with two abscesses. 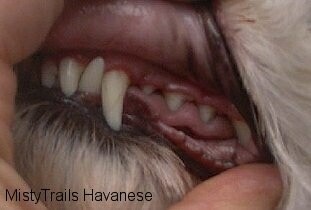 You can see the puss on the teeth.